It was a search for a better quality of musical instruments that brought the Congolese band Orchestre Baba National to Kenya in 1975. By then, the band was dominated by older musicians, who had the biggest say in the running of the Orchestre Baba National. This was frustrating for a group of young, talented musicians who were among the newest members of the band. Eventually, this group of young musicians led by Bwamy Walumona left the Orchestre Baba National. and formed the Orchestre Les Mangelepa on the ‘1st’ of July 1976. One of the reasons for forming the Orchestre Les Mangelepa was to showcase a much more youthful sound that would have a much wider appeal. That has been the case throughout their career, with the Orchestre Les Mangelepa establishing a reputation for consistently recording and releasing albums of timeless music. Sadly, these albums weren’t released internationally, and apart from a lucky few who came across copies of Orchestre Les Mangelepa’s albums on their crate-digging travels very few people outside of Kenya have heard the Orchestre Les Mangelepa, who nowadays, are regarded as one of the greatest ever African big bands. Now forty-one years after the Orchestre Les Mangelepa was founded, they’re about to release Last Band Standing, their first ever international release on Strut on the ‘30th’ of October 2017. It’s an opportunity to hear the Orchestre Les Mangelepa. After the Orchestre Les Mangelepa was founded on the ‘1st’ of July 1976, the Congolese musicians decided to settle in Kenya. Straight away, the Orchestre Les Mangelepa became a popular draw in the Kenyan capital Nairobi. That was where Israeli restaurateur Jack Gerchun first saw the Orchestre Les Mangelepa. He was so impressed by their music and onstage antics that he invited the Orchestre Les Mangelepa to play at his restaurant In The Park, where they regularly played. This was one many venues in Nairobi that the Orchestre Les Mangelepa played in. Soon, though, the Orchestre Les Mangelepa took to the stage at the Garden Square and Alliance Club, which were both popular venues. After a while, the Orchestre Les Mangelepa embarked upon their first tour of Kenya. There would be many more over the next forty-one years. However, the Orchestre Les Mangelepa were reluctant to devote all their energies to touring, and decided to divide their time between practising, recording and touring. Later in 1976, the Orchestre Les Mangelepa released their first album The Riot Continues (Mangelepa Kamili-Chapter One) on EMI. Led by Bwamy Walumona and Kabila Kabanze, the Orchestre Les Mangelepa showcase their considerable skills on their debut album. It was a tantalising taste of what was to come from the Orchestre Les Mangelepa. Two years later, in 1978, the Orchestre Les Mangelepa released two new albums on ASL. The first was Embakasi-1st Anniversary Album, which was then followed by Orchestre Les Mangelepa. By then, the Orchestre Les Mangelepa was touring far and wide. They had toured Zambia and Zimbabwe where they took to the stage alongside Oliver Mtukudzi. The Orchestre Les Mangelepa also played in Malawi, and in 1979, they released the live album Amua, Chafua Chafua, Shituka Shituka. It was a reminder of the Orchestre Les Mangelepa’s Malawian tour when this hugely popular and indeed influential group continued on their way to becoming one of the most popular African big bands enjoying hits with Maindusa and Embakasi. Back home, the Orchestre Les Mangelepa had been a catalyst for the evolution of African rhumba, which many believe is one of the greatest musical artforms in Africa. Meanwhile, the Orchestre Les Mangelepa was playing to huge crowds. By then, the Orchestre Les Mangelepa had a regular residency at the Park Inn, in Nairobi’s Uhuru Park, where they drew huge crowds from different ethnic backgrounds. They had one thing in common, a love of the Orchestre Les Mangelepa’s music. Their popularity was rising because of the success of their early albums. As a result crowds flocked to hear the Orchestre Les Mangelepa from far and wide at the Park Inn, in Nairobi’s Uhuru Park. When the Orchestre Les Mangelepa took to the stage, they always out on spectacular stage-show. The Orchestre Les Mangelepa featured a breathtaking horn section that accompanied tight vocals which delivered rueful, poetic and thought-provoking lyrics. The lyrics were sung in Swahili which united Kenyans from various ethnic backgrounds. This was the power of the Orchestre Les Mangelepa’s music, which began to evolve towards the end of the seventies. This was no surprise, as different types of music were popular in different parts of Kenya. Benga was popular on the shores of Lake Victoria, while Chakacha was popular on the coast. Both genres influenced the Orchestre Les Mangelepa, who incorporated it into their music. In doing so, they ensured that their music remained relevant. The style of music the Orchestre Les Mangelepa was playing was called Shindano ya Moto which features a distinct beat that has been influenced by Congolese Rhumba. There’s also elements if Cuban Salsa and Chakacha from Coastal Kenya in the Orchestre Les Mangelepa’s sound, which was proving popular across Africa. In 1979, the Orchestre Les Mangelepa were invited to play at Lugogo Stadium, in Uganda. Idi Amin’s eight year reign of terror had ended on the ’11th of April 1979. During that period, the former cook in the King’s African Rifles ruled Uganda with an iron fist. Idi Amin’s reign was blighted by human right’s abuses, ethnic persecution extrajudicial killings and gross economic mismanagement. With his reign at end, the Orchestre Les Mangelepa agreed to play in Uganda, where it was hoped they would bring about peace and a sense of hope. Sadly, there was problems within the crowd, and soon chaos reigned. This resulted in many people losing their lives. For the members of the Orchestre Les Mangelepa, this was hugely upsetting. The following year, the Orchestre Les Mangelepa released their first album of the eighties, The Golden Disc Award Winners, A.k.a. Lisapo in 1980. This was followed by two albums in 1982, Shindano Ya Moto (Golden Hits Of Orchestre Les Mangelepa) and the Orchestra Les Mangelepa released 7th Anniversary: Push Pousser Sukuma. They had come a long way in such a short time. With the Orchestra Les Mangelepa enjoying the most successful period of their career, they embarked on another torturous journey in 1982, Their final destination was Zimbabwe, however, the Orchestra Les Mangelepa journeyed via Tanzania and Zambia. This must have taken its toll on the Orchestra Les Mangelepa, and the band split in two. Seven years after the Orchestre Les Mangelepa split in two, Mangelepa released their new album Presents Kwasa-Kwasa Dance. It was released in 1989, on the Zambian R.T.P. label. Two years later, and the Mangelepa Kings, an offshoot of the Orchestre Les Mangelepa released Scud Missile Rumba on R.T.P. in 1991. Sadly, Scud Missile Rumba was the last album the Orchestre Les Mangelepa family would release for sixteen long years. The Orchestre Les Mangelepa returned in 2007 with their first album of the CD age, Golden Voices. It was a double album that was released by Sound Africa and featured the latest lineup of the Orchestre Les Mangelepa. They were celebrating their thirty-first anniversary, and were being hailed as one of finest African big band. That is still the case nine years later when the Orchestre Les Mangelepa made their first journey to Europe, forty years after the band was founded. Their destination was the Afrika Festival in Hertme, Netherlands. That was where the latest lineup of the Orchestre Les Mangelepa made a belated and barnstorming European debut. The Orchestre Les Mangelepa won over the enthusiastic audience with some of their best known and best-loved music. Still, though, the Orchestre Les Mangelepa had to release an album outside of Africa. That was soon about to change, and using the current lineup of their Nairobi Vibro residency, the Orchestre Les Mangelepa rerecorded and reinvented some of their most famous songs. These songs were given a makeover, and brought up to date on Last Band Standing, which is the Orchestre Les Mangelepa’s first ever worldwide release. Opening Last Band Standing is Kanemo, where stabs of horns soar above the arrangement before the rhythm section, keyboards combine with a guitar and percussion. They lock into a groove and create a backdrop for the joyous vocals. Soon, a jazz-tinged solo takes centre-stage before horns blaze. As they drop out, the vocals return, before another fleet fingered guitar solo is unleashed. When the vocal returns, it’s sung in a call and response style, as the rhythm section power the arrangement along and provide the heartbeat Later, another spellbinding shimmering guitar solo is added, before braying replace them. Together, with the vocals they create an irresistible, melodic song with an uplifting, feel-good sound. Just a lone guitar plays as Malawi Zikomo unfolds. Soon, guitars are joined by and the rhythm section and tight heartfelt harmonies. The lead vocal and harmonies carry the melody and are sung with power and passion. Soon, a braying saxophone soars above the lead vocal which is a soliloquy. They’re replaced by the jangling guitar that is found on many Afrobeat and Highlife releases. As it meanders across the arrangement, it responds to the lead vocal’s call while the rest of the band lock down the groove. Drums crack while the effects-laden guitar continues to respond to the call. Later, the vocals briefly returns, before the guitar enjoys its moment in the sun. It’s replaced by stabs of urgent horns, before the band reunite as this ten minute inventive epic reaches a crescendo. A jangling, shimmering guitar opens Mbungu before it’s joined by rhythm section and joyous vocals. Meanwhile, the bass, like the guitar plays a prominent role in the arrangement. So do the harmonies, and later, the impassioned lead vocal as it gives thanks. By then, drums crack and percussion joins the chirping, chiming guitar as the vocal continues to give thanks on this joyful, celebratory song. Just like other songs on Last Band Standing it’s the guitar that opens Maindusa. It’s joined by the rhythm section and percussion that provide the backdrop for the tight harmonies and lead vocal. Soon, they’re joined by bursts of horns. When they drop out, it’s melodic harmonies that take centre-stage. They’re accompanied by another glistening guitar solo which then accompanies the lead vocal and harmonies. Later, stabs of horns and drum rolls add to the uplifting sound. Meanwhile, the lead vocal drifts in and out, while the guitar is omnipresent. It’s joined by the Orchestre Les Mangelepa trademark tight harmonies which have been winning friends and influencing people for forty-one years. They continue to do on Maindusa which is akin to an irresistible call to dance. Gradually, Nyako Konya starts to reveal its secrets with guitars, rhythm section and harmonies combining on what’s a much slower, but beautiful heartfelt track. The band take care not to overpower the tight, heartfelt harmonies as guitars chirp and chime. Bursts of horns punctuate the arrangement at the midway point, before a lone horn and then guitar take centre-stage. Both showcase their skills, before the lead vocal returns. Still, the guitar chirps and chimes as the rhythm section and percussion provide the heartbeat to the vampish vocal. As it drops out, the guitar annoys its moment in the sun and plays a leading role in the sound and success of the track. After a guitar makes a brief appearance on Suzanna, horns blaze and combine with the rhythm section. Everything drops out leaving a heartfelt vocal. It’s soon joined by the rhythm section and percussion, while horns punctuate the arrangement. After they drop out, harmonies enter, while the trademark chirping guitars join crisp drums. They accompany the emotive vocal on this heartfelt ballad. When it drops out, horns soar above the arrangement and drums propel the arrangement along. Again, the guitars are at the heart of the mesmeric arrangement, as tight, powerful harmonies give way to the vocal on one of the highlights of Last Band Standing. Horns are to the fore on Mimba, but when they drop out, the rhythm section and glistening guitar accompany another impassioned vocal. Again, the bass plays a prominent role, and joins the guitar in providing an accompaniment for the vocal. Later, blazing horns interject, and are replaced by the tight, soulful harmonies. They take centre-stage on this beautiful, memorable and melodic song that features the Last Band Standing at their best. Ma Lilly a nine minute ballad closes Last Band Standing. A soul-baring vocal is accompanied by a guitar, bass and percussion. They provide an understated backdrop as the vocal combines power and passion. Later, an organ is added and the drums mark time. Just like the rest of the band, they play with the utmost care ensuring they don’t overpower the vocal on this beautiful soul-baring ballad. It’s another of the highlights of Last Band Standing. Ten years after the Orchestre Les Mangelepa released their last album Golden Voices, Africa’s top big band make a welcome return with Last Band Standing, which will be released by Strut on the ‘20th’ of October 2017. 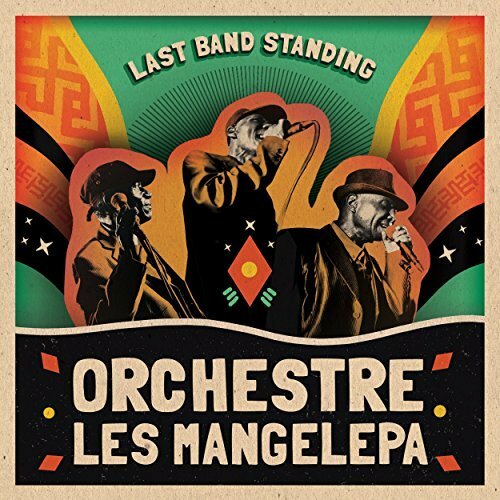 Last Band Standing is the Orchestre Les Mangelepa first album in their forty-one year history to receive an international released. Somewhat belatedly the rest of the world have the opportunity to discover the delights of the Orchestre Les Mangelepa’s music on Last Band Standing. The Orchestre Les Mangelepa were a pioneering band, who have enjoyed an unrivalled longevity in African music. Their original trademark sound was called Shindano ya Moto and featured a unique beat that had been influenced by Congolese Rhumba. To this, the Orchestre Les Mangelepa added elements of Cuban Salsa and Chakacha from Coastal Kenya. However, on Last Band Standing, the Orchestre Les Mangelepa reinvent eight of their best known and best-loved songs. These eight lengthy songs also incorporate elements of Afrobeat, funk, Highlife and jazz. Especially the guitars which often have a jazz-tinged sound. There’s also a soulfulness to the vocals on Last Band Stand Standing. They veer between soul-baring and heartfelt ballads to joyous and uplifting uptempo tracks that are guaranteed to get any party started. Last Band Standing also features one of what was one of African music’s best kept secrets, the Orchestre Les Mangelepa whose albums have never before been available outside of Africa. That is about to change with the release of Last Band Standing, which features a tantalising taste of the Orchestre Les Mangelepa who are, without doubt, the greatest ever African big band.